Built with a focus on security and durability, the USB Drive comes highly recommend for users, both home and corporate alike, who like their data secure and encased in Lenovo's trademark durable soft touch rubber paint. 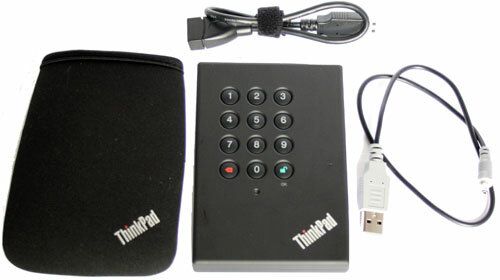 The Lenovo ThinkPad Secure Drive features a durable keypad construction with metal domed keys numbering from 0 to 9 and a separate key for unlocking the drive and canceling a falsely entered key-code. These keys will enable you to store up to 10 user and 1 administrator accounts via a combination of 6 to 24 digit key-codes. As you can already begin to imagine user and key-code setup are step short of accomplishing the impossible so I’ll only mention that you will definitely need to read the thorough user guide included on the drive itself as an Adobe PDF formatted document. That a fully printed copy of the 17 page user guide was not included with the relatively expensive packaging is something that is inexcusable on Lenovo’s part. To access the drive you’ll first have to power it on by connecting the permanently tethered cable to a host computer’s USB port. When not in use, the attached USB cable neatly folds away into the drive’s case to avoid snagging on other objects while being carried around. Once plugged into a USB port the drive will wait until an appropriate key-code is entered on the integrated keypad. Once the key-code is entered the drive will immediately be accessible on any computer supporting USB removable storage. No additional drivers are needed to interface with the drive or use the AES-128 bit encryption functionality. The encryption is handled on-board and is completely independent of the operating system, leaving no open interfaces for potential data thieves to hack the drive. The 128-bit Advanced Encryption Standard (AES-128) offers some of the best protection levels available for military, government, businesses and home users. Theoretically a hacker would need the combined processing power of a 1st world country to be able to hack the drive’s contents within his life-time. With the integrated AES-128 bit encryption engine running while you’re transferring files to and from the hard drive you should barely notice any real impact during use. All encryption and decryption is handled by the dedicated processor on the hard drive, so you’ll get all the security and performance the drive has to offer without any user intervention. If the drive is detached from the USB after a key-code is entered the drive will then revert back to a locked status. The same applies if the USB power is shut down when a computer reboots or shuts down. Hot-swapping the drive between multiple computers at a LAN party can prove rather annoying after having entered the key-code for the tenth time. Beyond the keypad, the drive has no other software or hardware for interfacing and configuring the user access of the drive. All users share the same drive partitions and no partitions can be assigned to specific key-codes. Since the drive also has an on-board encryption engine you will most likely not be able to swap out the drive for a larger capacity later on since many manufacturers with these type of products lock the encryption engine to the specific drive. If the drive inside also fails it will most likely mean all your data will be lost since the encryption is unique to each drive and thus, non-recoverable. Out of the box 319,962,849,280 bytes (297 GB) are available to the user while approximately 100 MB are used for drive partitioning and the user guide. Even though Lenovo only states official support for Microsoft Windows Vista SP1 and XP SP2, the drive does operate on both MacOS X and Linux based systems since there is no dependency on a proprietary driver to interface with the on-board encryption engine; instead, all the encryption and decryption is handled elegantly by the drive itself and the only thing the user will ever see is another portable hard drive. We used the drive for roughly a month between our home and office without any damage caused to the drive case. Lenovo really did a good job with the durable soft touch rubber paint since it’s easy to grip and does not succumb to damage easily. Even the keypad labels remained legible so you won’t have to worry about the keypad characters rubbing off after numerous key-code entries. Of course, if the keypad itself is destroyed then the hard drive also becomes inaccessible until the keypad is replaced. The attached USB cable is also very securely fitted into the drive case and endured a lot of strain while hanging off the back of my motherboard with the drive floating in mid-air. Personally I would love to see more external drive manufacturers using the same material as the Lenovo Thinkpad USB Portable Secure hard drive case rather than cheap plastic or cold metallic cases. Lenovo Secure Drive’s tethered USB cable in the compartment. For the price I would have expected some more features to help ease the use of the drive. Similar to the Lexar JumpDrive Mercury, Lenovo could have included a on-board capacity meter when the drive is not plugged into a computer. Often you’ll find yourself keying in your private key-code only to discover the drive is already filled to the brim. The implementation of the before-stated capacity meter would help avoid this frustration and I really cannot fathom why no other external storage manufacturer has grasped onto building this into their product and at a time when companies are facing increasing pressure to explain their expenditures, this drive would probably prompt any corporate to evaluate their purchasing decision very carefully. The keypad does not give any audible beep when a key is pressed and no back-lighting is present anywhere. Given that user interaction is required to actually be able to interface with the drive and that many users access drives in areas where it may not always be easy to read the keypad, back-lighting could have been a saving grace. Audible beeps may have proven annoying after repeated key-code entry but Lenovo could have set this up as a user configurable option. The lack of management software also means no opportunity to set a time-out value or the allowed operation hours for the drive. We know a fair number of businesses that would have liked to see the drive time-out and reset to a locked state after a few hours of in-activity, after all, how many employees would forget to remove the drive from their computer before going home and therefor leaving it completely unlocked. For an external hard drive that costs about twice as a comparable non-AES 128-bit encrypted drive, I would also have expected at the absolute very least some more functional LEDs and some level of assigning user accounts quotas for the whole 320GB. This way multiple users would all have their own private partitions to store sensitive data on. The included hard drive case feels rather cheap and could have included cut-outs where the keypad is located to protect the drive but still allow easy access to enter key-codes. Currently, you have to first remove the drive from the case before you can even start using it which, from an end-user perspective, inconveniences you. Thankfully Lenovo includes an extra USB extension cable to help extend the integrated USB cable’s reach to either the back or the front of a computer. The additional USB power cable is terminated on one end with a USB connector and on the other with a standard industry power jack. The drive did work on a variety of computers without any additional power requirements, meaning you’ll barely ever have to pull the cable out to get the drive working but it just means that as a user you’ll be carrying around yet another cable. Why Lenovo chose to use this extra USB power cable instead of just opting for a Y-USB cable when everyone else does is a complete mystery. 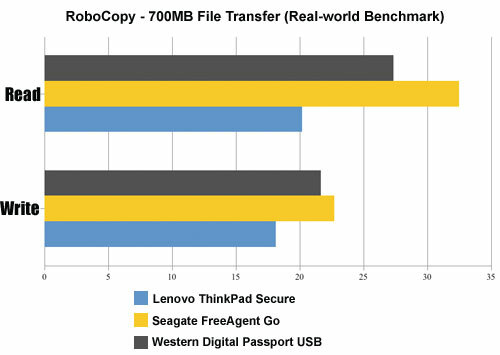 We took the Lenovo ThinkPad USB Portable Secure Hard Drive on our typical benchmark run with our system equipped with a Core 2 Duo E6600, ASUS P5B Deluxe WiFi motherboard, ZOTAC GeForce GTX 260 AMP2! Edition graphics card and Windows Vista 64-bit with Service Pack 1 installed. As a comparison we also included the Seagate FreeAgent Go 500GB and Western Digital Passport 250GB hard drives, both of which feature a USB interface. Using SiSoft Sandra’s Removable Storage benchmark for our synthetic testing, the drive reached an impressive 29.87MB/s read speeds for both 64MB and 256MB file sizes. While the read speeds are fairly standard for external storage devices over USB, the write speeds are what really impressed us. After re-running our tests a second time we reached write speeds of 25.60MB/s for both 64 MB and 256MB file sizes. These write speeds are impressive to say the least but are not really indicative of real-world results the average user would see. Moving on with our Robocopy real-world benchmark suite, we copied a 699MB ISO image file from the hard drive, reaching 27.35MB/s read speeds and to the hard drive, only reaching a maximum of 21.68MB/s for write speeds . Not quite the same scores SiSoft Sandra was reporting but still a fairly decent score over the USB interface. If we had to hazard a guess why the difference in scores was occurring, it could be related to the on-board AES-128 bit encryption causing mixed performance results. Secure, portable, durable and good looking. This is what external hard drives should strive to be. With some minor tweaks to packaging and the product Lenovo could have a real winner on it’s hands providing the cost of the product doesn’t scare you off at first. Overall the drive was impressive during testing but for the price I expected a bit more. The ThinkPad USB Portable Secure Hard Drive comes highly recommended for home and business users alike looking for data security but is not the ideal companion for users on a tight budget or who don’t really need the security features.